Apple had never taken Blu-ray seriously. You can find that there’s never a Blu-ray drive built into a product from Apple. Even the optical drive that Apple sells doesn’t support Blu-ray. Does that mean the MacBook Pro is not capable of playing Blu-ray? Not necessarily. Although Blu-ray is not officially supported by Apple, you can still play Blu-ray on MacBook Pro. But you are going to need something extra to make that happen. 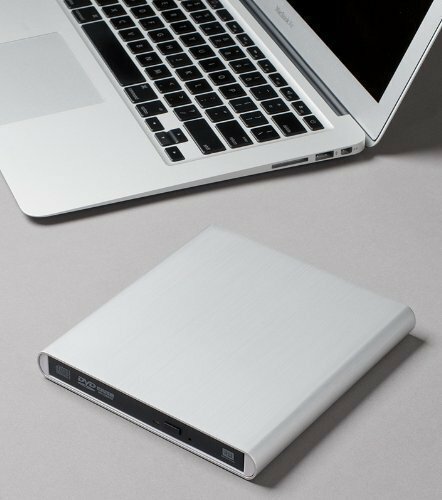 The first thing you need is a Blu-ray drive that would allow you to read a Blu-ray disc on your MacBook Pro. The second thing is a proper piece of Blu-ray player software to play the Blu-ray movie. As Apple doesn’t have hardware that supports Blu-ray, it’s only logical that its software isn’t prepared for Blu-ray playback. Both iTunes and QuickTime on macOS are not capable of playing Blu-ray even if you’ve got the Blu-ray drive ready. In order to play Blu-ray smoothly on your MacBook Pro, you need to download a Blu-ray player program, like Leawo Blu-ray player, to play Blu-ray movies after you put the Blu-ray disc in your Blu-ray drive. 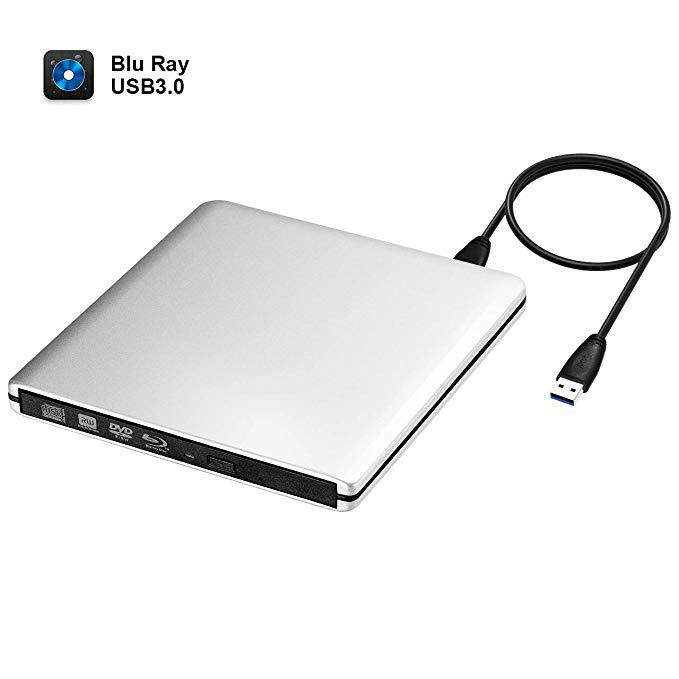 Below are several Blu-ray drives you can purchase online that works with MacBook Pro. This Blu-ray drive from Pioneer is compatible with macOS and it’s more than a Blu-ray drive. It’s also a Blu-ray burner. The slim body gives it a sleek look and makes it easy for you to carry it around. And it’s fast in reading and burning Blu-ray/DVD discs. It also has the USB3.0 interface to ensure its compatibility with different PCs. It’s priced at $123, slightly above average. If you want a high-end Blu-ray drive with the fastest Blu-ray reading and burning speed, this is the one to get. This TopElek Blu-ray drive is also a very powerful Blu-ray reader and burner. Not only is it fast in reading and burning Blu-ray/DVD discs, it also supports playback of 3D Blu-ray discs. As 3D Blu-ray is getting more and more common, the support for 3D Blu-ray playback would be a must in the future for Blu-ray drives. It’s a pretty powerful and future-proof Blu-ray drive. It comes with USB3.0 support out of the box which is downward compatible with USB2.0/1.0. 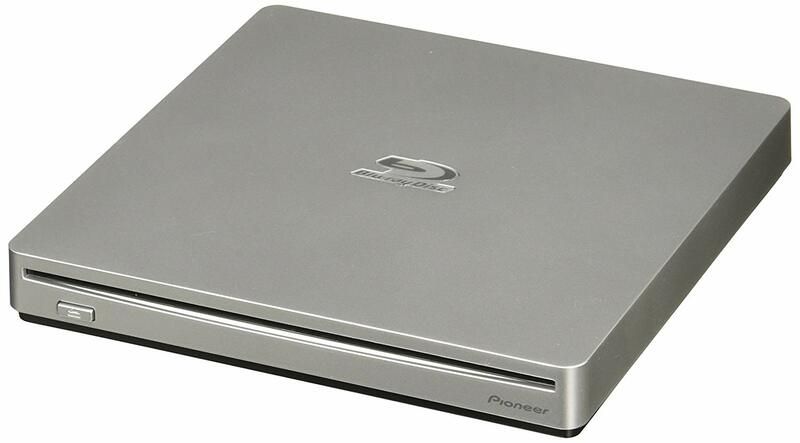 It also has a slim and sleek looking body that makes it a one of the most portable Blu-ray drives. This Blu-ray drive also support playback of 3D Blu-rays. It can play and burn Blu-rays. The aluminum casing is sleek looking and at the same time makes it durable and scratch-resistant. It’s also very lightweight and easy to be carried around with your MacBook Pro. You can get it for $86.90 from Amazon. As I’ve mentioned previously, Apple doesn’t support Blu-ray, so you will have to get your own software to play back Blu-ray movies on your MacBook Pro. 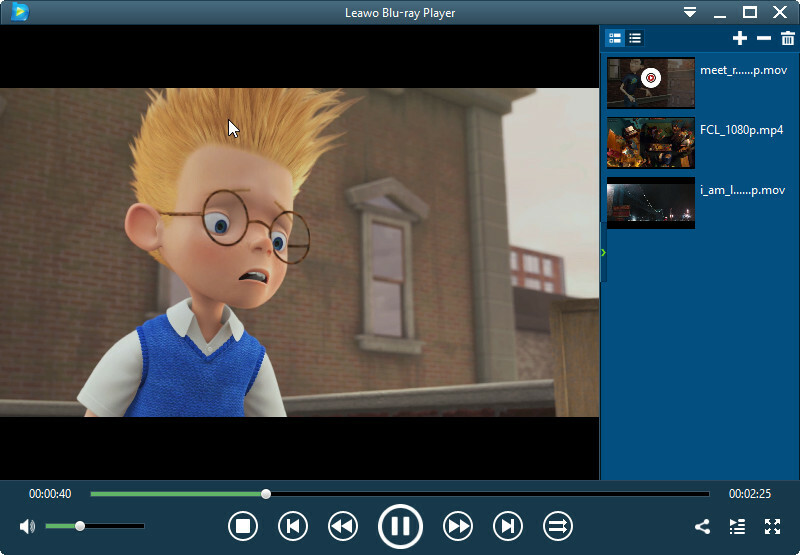 Check out Leawo Blu-ray Player, it’s a high quality piece of Blu-ray player software. Not only can it play 3D Blu-rays, it’s also able to play Blu-ray discs from all regions. And it only uses about 4 percent of your CPU’s processing power when playing Blu-ray. So it won’t slow you down when you are playing Blu-ray movies with it. And most importantly, it’s free. If you need a simple and powerful Blu-ray player program, Leawo Blu-ray player is your best bet. When you have a Blu-ray drive for your MacBook Pro, there are more things you can do with it other than using it to play back Blu-ray movies off a Blu-ray disc. For example, you can back up your Blu-ray collection to your MacBook Pro if you have free space on your hard drive to do so. After having the disc backed up, you won’t have to worry about the disc being damaged or scratched. If you do want to back up your Blu-ray discs to MacBook Pro, check out Leawo Blu-ray Copy. The company Leawo Software is well known for developing high quality Blu-ray processing software and the Leawo Blu-ray Copy is one of their proud products. The biggest selling point is its ability to perform 1:1 lossless Blu-ray/DVD copying. 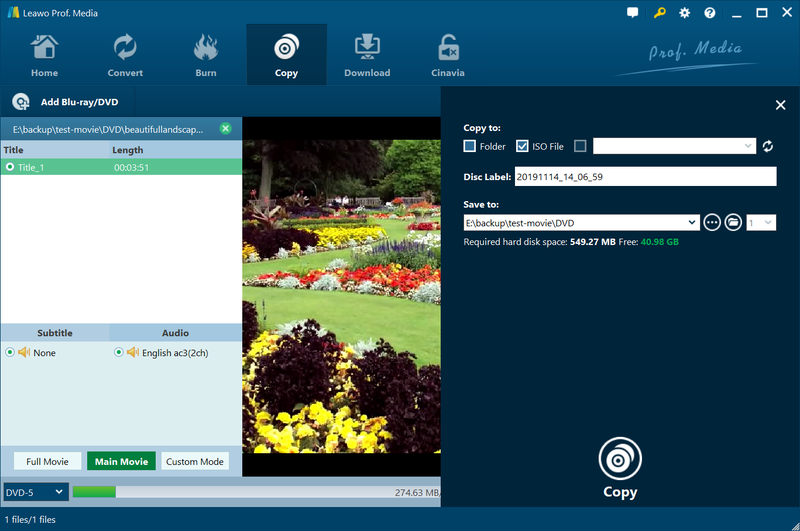 You can use it to copy your Blu-ray to your hard drive as a Blu-ray folder or convert the Blu-ray content to an ISO image. Both forms of backups are lossless. It can also help you copy one disc directly to another disc if you have two Blu-ray drives. Leawo Blu-ray Copy is also a Blu-ray/DVD writer. The Blu-ray folder and the ISO image you get from the program can also be burnt to a blank disc later using the program itself. Check out how to back up your Blu-ray collection with it in the content below. Note that Leawo Blu-ray Copy isn’t an independent program. Leawo uses a software suite called Prof.Media to pack several products together. To open Blu-ray Copy, first launch Prof.Media from the launch pad of your MacBook Pro, fire up Prof.Media and click the tab with the Blu-ray Copy label on it to open Blu-ray Copy. The first thing to do after opening Blu-ray Copy is manually add the data in the Blu-ray disc to the program. To do that, you can click the Add Blu-ray/DVD button that can be found in the upper-left. There will be a drop-down menu with 3 more options for you to import source media files from 3 sources. Click on the first option, which is Add from CD-ROM and the following menu will show you the title of the Blu-ray disc in the drive. Click on this option to have the Blu-ray data loaded to the program for processing later. A Blu-ray disc will typically include contents like bloopers or post-credit scenes in it. You don’t have to back them all up if you don’t want to. The program can recognize all the separated video titles in the disc and offers you with the option to pick out the content you don’t need. On the following interface, there’s a sidebar on the left with 3 lists and several buttons on it. The video title list shows you all the videos in the disc, the subtitles list and audio track list is showing you all the subtitles and audio tracks. Below the lists are 3 buttons. They are the copy mode buttons that can help you quickly pick out the content you want to back up from the list. 1. If you choose Full Movie, then all the data in the disc will be backed up. 2. If you click Main Movie, you will find that there’s only one video, one audio track and one set of subtitles are chosen on the respective lists. That’s because it helps you pick out the main movie from all those videos. This mode will only include the main movie in the backup. You can reselect the video, audio track and subtitles directly on the respective lists under Main Movie mode if you want. 3. Custom Mode is for when you want to choose the content you need manually. After choosing this mode, you can pick the videos, audio tracks and subtitles you need directly on the respective lists. After you are done select the content to back up, click the button in the bottom-left of the sidebar to set what format you want to keep the backup in. To back up a disc losslessly, you can choose a format the same as the original disc. You are also able to compress BD50 to BD25, BD to DVD or DVD-9 to DVD-5 if that’s what you want. There’s a Copy button in the upper-right of the video player window. Click on this button and there will be a sidebar appearing from the right side of the program. This step will help you decide the form of the backup. 1. The Folder option will copy the disc folder and store it on your hard drive. 2. The ISO file option will have the Blu-ray converted into an ISO image and stored on your MacBook Pro. 3. If you have a Blu-ray burner connected to your MacBook Pro, you can put a blank disc in it and connect it to your MacBook Pro. And then you would be able to select it as the target by checking the third option to back up the original disc to the blank disc in the Blu-ray burner. If you choose to go with the first two options, set the location for the backup in the Output Directory box below. And then you can start to back up Blu-ray to your MacBook Pro by clicking the Copy button in the lower area of the sidebar. 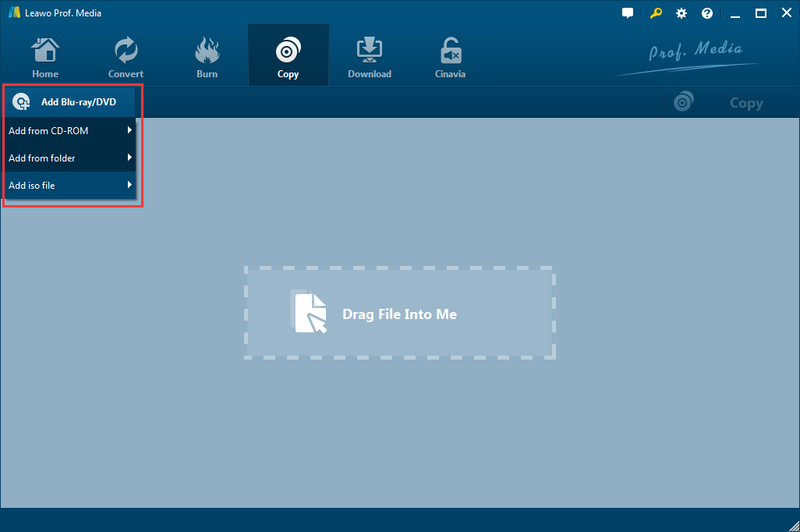 Note: The Blu-ray folder or the ISO file you create using Leawo Blu-ray Copy can both be burnt to a blank disc to create a new copy of the original Blu-ray disc using the program itself. So even if you don’t have two Blu-ray drives available, you can still back up a Blu-ray disc to a blank disc if you want, but you’ll have to make sure that the Blu-ray drive you use is also a Blu-ray burner. 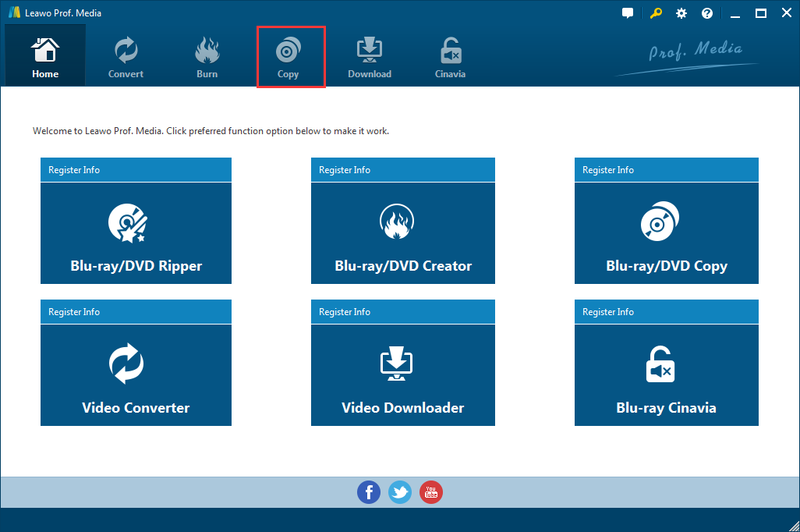 Check out the video tutorial of using Leawo Blu-ray Copy to back up a Blu-ray disc below.